Some obsessions are, really, wonderful indeed. "You too can have a train in your basement if you have two things. One, you have to be completely insane. Two, you have to have an amazing wife." More details at KingstonSub.com The name Kingston Sub refers to CN's Kingston Subdivision, the railway tracks between Toronto and Montreal. "The cleaner drove the train at high speed, considerably higher than normal on that stretch, to where the rails end and crashed into a house," said Jesper Pettersson, spokesman at Stockholm Public Transport (SL). 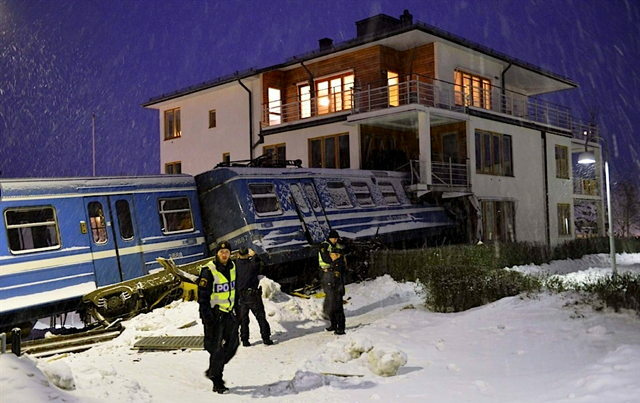 The train ploughed past the end of the line and vaulted over a street separating the house from the depot, crashing through a balcony and into a downstairs room in the upscale suburb of Saltsjobaden. Wow. All that talent and yet he is captivated by his insanity. I want one! Some people build the bridge of the USS Enterprise, wear Starfleet uniforms and for them, that is all that is required for basement living. Okay, I don't feel so strange now. All I do is paint little armymen, push them around a table and say "pew-pew" with friends. Dr. Nick Muff in Sedro-Woolley (that's in Skagit County, two counties north of our host [Originally separate RR towns on either side of the Skagit river, hence the hyphen]) has not only a replica Pullman car in his basement complete with bed and bath fixtures, but the sawed-off cab from a real EMD F-unit completely repainted in Kansas City Southern-Southern Belle livery, and restored with working engineers stand, lights, realistic engine noise generator, AND horn (your correspondent has visited and knows from practical experience and the resulting hearing loss that it does indeed work). Video tour here. He's not wearing his Pullman Conductor suit, alas. The back story behind the cab is that he wanted an engineer's stand for his layout room, so he and his extremely tolerant wife went down to a RR scrap-yard in Tacoma to buy one. While discussing the details with the yard boss, his wife asked what would happen to the rest of the engine. Answer: it would be cutup for scrap to ship to Asia. She said "why don't you just buy the whole cab." They ended up get the cab for the cost of torching it off the engine body. Had to haul it home in 3 parts on a friends trailer and completely sandblast the 9 coats of paint off it prior to reassembly and installation. Built a new basement to house it, with a false block wall so that it can be freed if needed. Very impressive. If you ever visit Jewel, he might even let you drive. I guess HO scale didn't cut it for him. He's happy and his wife knows where he is at night. Win-win. How terribly unSwedish of the cleaning woman to do that! I wonder if there's a Mohamed in her name somewhere. What's funny about rail fans is that they generally make horrible co-workers. They tend to get distracted by thinking about what they are switching instead of what they are doing and almost get themselves killed.